I may be more connected to my Italian roots, but my mother blessed me by marrying a full-blown Irishman! So not only do I love to eat, but I also like to enjoy a drink or two... or three! Being 50/50 Irish and Italian has always been quite fun for me growing up. Being able to celebrate and learn about each culture's traditions has been quite the experience. Not only am I lucky to be half Irish, but am especially lucky to live near Boston, because when it comes time to celebrate my Irish heritage on St. Patrick's Day, it is always a good time at the Pubs downtown! While on the topic of celebrating, I just want to sidetrack for a moment and add a thank you to Sabrina from Eat, Drink, and be Merry for awarding me with the "One Lovely Blog" Award. I love knowing that other people enjoy reading my blog as much as I enjoy writing it! So thank you! 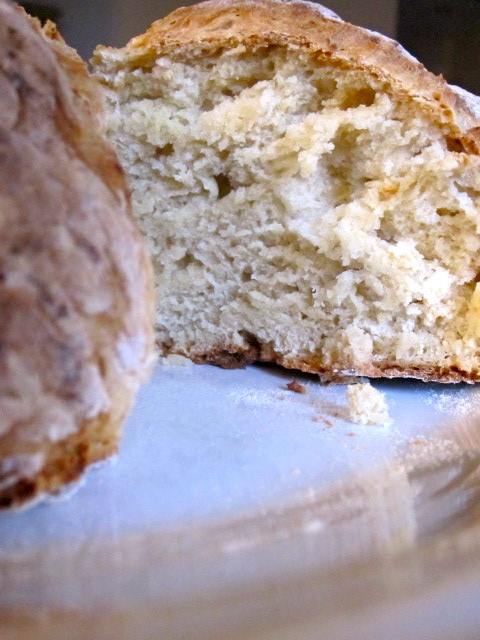 In order to properly celebrate the upcoming St. Patrick's Day, I will be posting several different traditional Irish recipes - the first of which will be Irish Soda Bread! Now, the key word here is traditional. There are so many Irish recipes in the states that have a ton of different ingredients and variety of flavors. For instance, many people tend to add raisins to Soda Bread, when in actuality; traditional Irish Soda Bread has no fruit in it whatsoever! When you add fruit, it is considered to be a teacake or fruit bread, but not soda bread. Although you can add fruit to jazz it up, the Irish are very simple and when it comes to their baking, simple is more! There are two different types of Soda Bread: Cake and Farl. The cake style of Soda Bread (like in the photo shown above) is the more common type of Soda Bread. It is kneaded and shaped into a mound, cut into halfway cross wise, and baked in an oven. When making farl, the dough is cut completely through cross wise to create four separate pieces and is usually baked in a heavy frying pan. Below you will find the basic recipe for Irish Soda Bread as well as a couple of different variations. (If you want to try a recipe with fruit you can add a 1/2 cup of raisins, craisins, or currants. If you do not want to add fruit, you can still jazz the recipe up a bit by adding a teaspoon of sugar). Preheat the oven to 425 degrees F. Prepare a baking sheet with a little bit of flour so the dough will not stick when placed on the sheet. In a bowl, sift together all of the dry ingredients. Working somewhat quickly, add the buttermilk and combine to form a sticky, rough, dough. Dump the dough out of the bowl and onto a floured surface. Knead the dough, but only for 30 seconds or less. You do not want to over-knead! The dough should still be fairly rough and lumpy. Place the dough onto your prepared baking sheet and form it into a round mound. Using a sharp knife, cut a cross halfway through the length of the dough. Place in the oven and bake for 45 minutes or until the bread feels hollow. You can check this by picking up the bread and tapping the bottom of the loaf. For a less crunchy crust, remove the bread from the oven once it is done and cover with a clean tea towel or dishcloth. If you want a more hard crust, then just let the bread cool openly on a wire rack. Now, since I was awarded the "One Lovely Blog" Award, not only will I thank Sabrina more than once for awarding me this, but I will also pay it forward to 15 other bloggers who I admire! 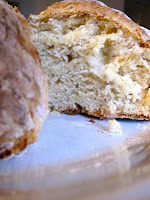 Thanks again Sabrina and I hope you all enjoy this Irish Soda Bread! Your Irish Soda Bread looks delicious! A slice of that with some butter = yum!! Thank you so much for the award too! Thank you for awarding me!! I am so grateful! I'm doing a happy dance.... I really appreciate it! (((hugs))) ! Just last night I was asking my very proud Irish uncle about soda bread and he told me the same thing - no raisins in soda bread! I love Irish Soda Bread :) your looks so yummy! Thanks for the lovely blog award!! I appreciate it!! I am like you, glad to know other people enjoy reading my blog as much as I love doing it!!! Thanks again! And love the irish soda Bread! I can't stay away from sweets long enought to make bread these days! Hellooo there, Oh thank you so much for the lovely award for the lovely blog .. very generous of you . I need to learn a lot more of what to do & what not to do & how to do all!!! I've never actually tried Soda Bread, it looks very inviting, looks absolutely gorgeous, well done. Thank you for sharing. Also, I'm from near Boston as well! Great city - I'm moving back this summer and am looking forward to it. Oh this bread looks so inviting! Looks delicious! I'm looking forward to seeing more traditional Irish recipes. Thanks for sharing! oh this looks lovely! my hubby was just mentioning irish soda bread the other day for some reason... it's good to snack on. =) and i just saw that you passed the lovely blog award to me, thanks so much elyse! Oh, boy...this is the way I like soda bread...plain! It looks fabulous!!! Irish/Italian myself! I love some Irish soda bread plain with some really good butter. Best way to celebrate the holiday in my opinion! I love Irish Soda bread! It was a staple growing up as my dad is half Irish. This alongside a big helping of Colcannon was one of my favorites as a kid. My first job was at a bakery and we always made irish soda bread around this time of year! I love it! It has such a distinct flavor! You're very welcome for the award!!!!! love it, and you certainly have an extremely helpful article.